Another great result from the famed breeding program of Mr. Bear ! This particular variety of Paph. 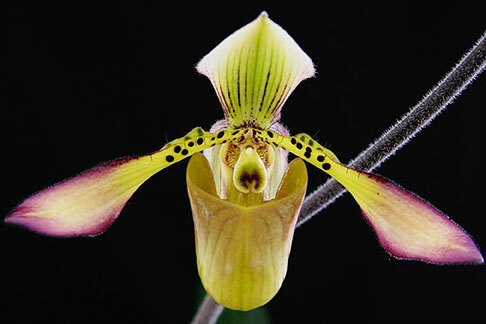 lowii is a compact to miniature grower as opposed to the much larger regular form of Paph. lowii. Capable of bearing up to several flowers per inflorescence on a fully mature plant, the variety richardianum bears the same charming Paph. lowii-type flowers but in a much more manageable size. Very Highly Recommended !